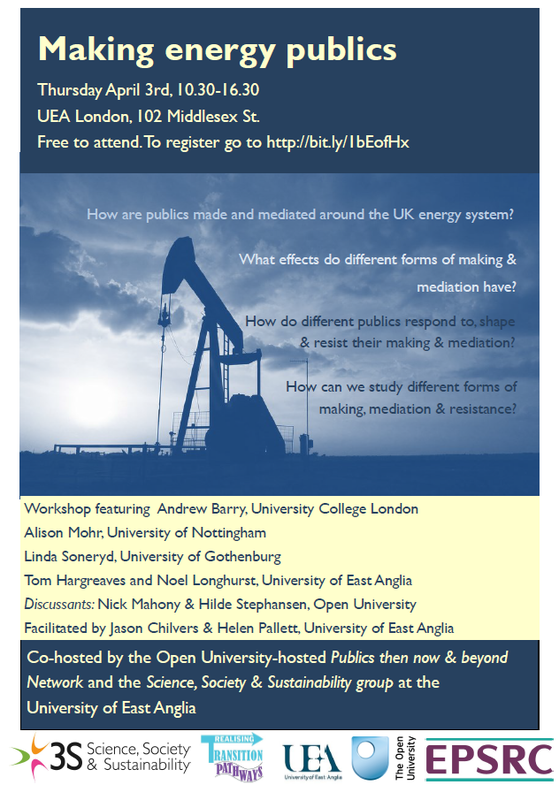 The third event in our travelling seminar series will be a seminar on ‘Making Energy Publics’ at the University of East Anglia in London on Thursday 3rd April, 10.30 – 16.30. Speakers: Andrew Barry (UCL); Linda Soneryd (University of Gothenburg); Alison Mohr (University of Nottingham); Tom Hargreaves and Noel Longhurst (UEA); Nick Mahony and Hilde Stephansen (Open University). All are welcome. To register click here. The second event in our travelling seminar series will be a seminar on ‘Smart publics? Mediation and public engagement with science and technology’ at the University of Sussex on Thursday 5th December, 11.00-15.00. The seminar will feature papers from Aristea Fotopoulou, Jenn Barth and Tobie Kerridge. All are welcome. To register email a.fotopoulou@sussex.ac.uk. Over the 2013-14 academic year, members of the Publics then, now and beyond network will be organising a travelling seminar series. These events will will be hosted by members’ home institutions, with support from the Open University’s Faculty of Social Science, and feature both internal and external speakers. The first event in the series will be a lunchtime seminar on ‘Public memories, public knowledge? Movements, media and shifting formations of publicness‘ at the London School of Economics on Thursday 7th November, 12.30-14.00. The seminar will be chaired by Nick Couldry (LSE) and feature papers from Pollyanna Ruiz (LSE) and Hilde C. Stephansen (The Open University). 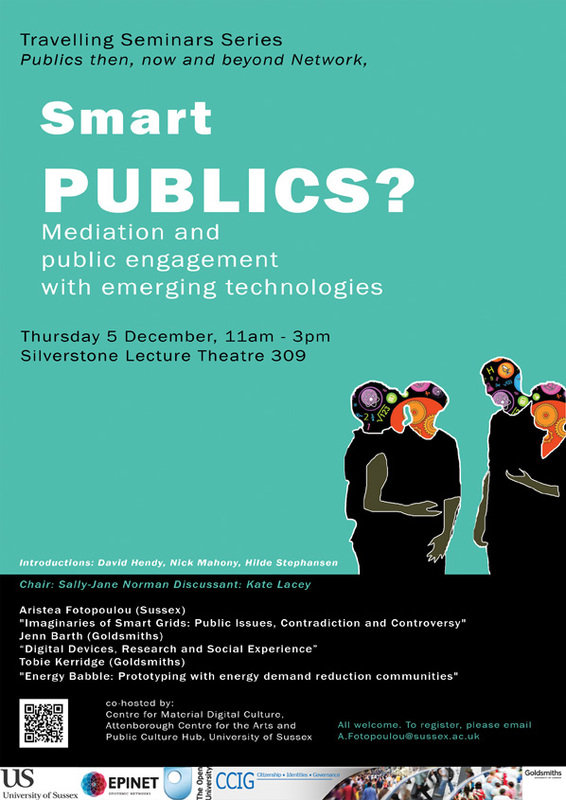 A seminar on ‘Smart Publics’ will be hosted by the University of Sussex on Thursday December 5th. More details to follow soon! Welcome to the website of the publics then, now and beyond network – an international and interdisciplinary network of researchers who are interested in the mediation and making of publics, the changing character of public institutions, new configurations of public issues, and the publics of public engagement. This is a new network and this site is currently under construction.